The ME building, dedicated to the mechanical engineering department, was built by the Zweifel + Stricker + Associates team in the early 70s, during the first phase of development of the campus. Its spatial organization bears testament to the tenets of the original master plan: the separation of cars and pedestrians into two different flows, as per Modern Movement in architecture principles, means that access to the building happens on multiple levels. The building has a three-dimensional grid (23’-7” length by 12’-9” height) which divides its space in a controlled way, regardless of type or purpose. The original master plan was revised several times over the ensuing decades, to question some of the initial projections, and to adjust it to inevitable evolutions such as a growing number of visitors and new usages. Moreover, the remarkable design of the Rolex Learning Center – which sits in the vicinity of the mechanics hall – leaves room for multiple architectural styles, allowing for the identity of the school to be renewed and for the campus itself to become a whole new district in the greater Lausanne metropolis. 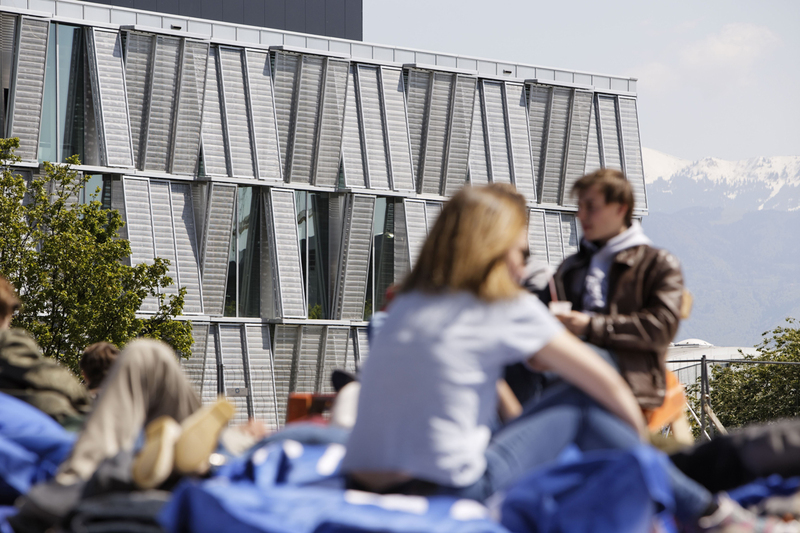 Since the early 2000s, in an effort to promote its top-level teaching, research and innovation activities, and to attract more international students, the EPFL itself undertook several redevelopment operations. The campus and the buildings were refurbished, including the ME building which had gradually become cramped and was rapidly deteriorating. The project of the Dominique Perrault Architecte / Steiner team, which won a 2010 international competition, is to preserve the connecting axes that bridge the campus, while demolishing the aging halls. A new rectangular hall is wedged to the “bridge” buildings, which are left as is, save for a refurbishment of their two lower levels. The new building, covering a total surface area of over 19 000 m², is spread over four superstructure levels and one infrastructure level. It houses the administrative offices of the department of Engineering (Sciences et Techniques de l’Ingénieur, or STI), consisting of offices and research laboratories, as well as some office spaces for the department of Biology (Sciences de la Vie, or SV). The building, which serves as a large-scale experimental playground and laboratory for research scientists, consists of two wings connected by a large central atrium. In functional terms, the wings can be considered as two separate buildings, with their own technical and circulation networks. The partition of the space respects the original grid while playing with subdivisions and double heights. The materials used – raw concrete and metal walls, cement and PVC floors – favor a simple black-and-white palette in matt and glossy finishes. The opaque walls and glass screens create a set of perspectives into the depths of the building, turning any walk along the corridors into an original experience. The technical networks, left apparent on the walls and ceilings, are a nod to the scientific purpose of the building. Individual offices occupy a peripheral strip along the external facade. Each office is wide open to the outside world thanks to bay windows that fill the workspaces with subdued natural light. These comfortable, luminous and spacious rooms are apt spaces for long hours of research work. The atrium, a reception and social area serving the office spaces, is the beating heart of the building. Straight stairways and flared corridors flow diagonally from one level to the next and from one side to another, filling the central void with a blur of lines. Handrails and tubular wall-mounted lamps, accented in black, add to an overall graphic effect designed by Gaëlle Lauriot-Prévost, inspired by Piranese’s Capricci. Superimposed planes and criss-crossing lines create a dynamic tridimensional picture, which is deconstructed and reconstructed by each visitor passing through it. This plan turns the atrium into a fantastic spatial experience, while reinforcing its social function, by favoring chance encounters without impeding circulation. With its wide open plan and high ceilings, the atrium goes above and beyond its primary purpose as a reception area, turning into a space for experimentation. 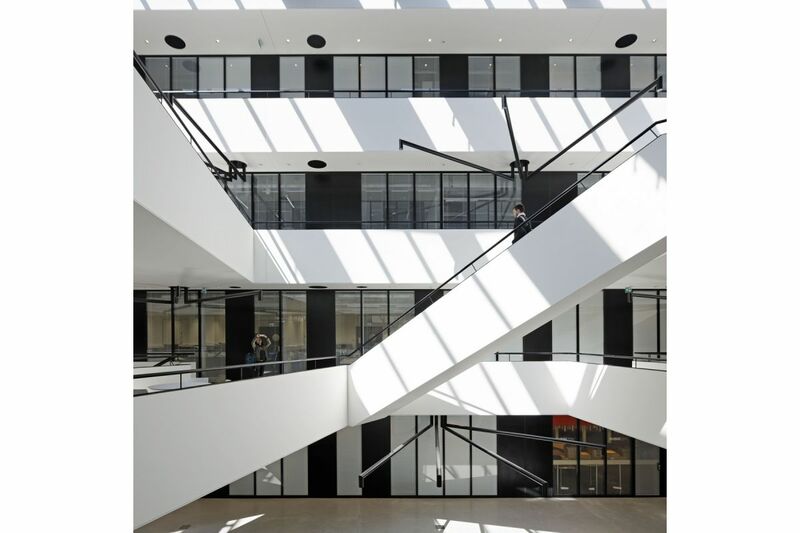 Placed at a crossroads position on the campus, between different disciplinary fields and as an entrance point for hyper specialized technical laboratories, the atrium is conceived as an accessible door to knowledge and an empirical, experiential space. The façades combine two distinct architectural styles in one common material, giving the building a contemporary allure while paying tribute the legacy of the 1970s. The metallic mesh, on the one hand, evokes the scope of mechanical engineering, while the northern façade is a direct reference to the molding envelopes of the neighboring buildings. The mechanical façade stands to the East, South and West of the building. 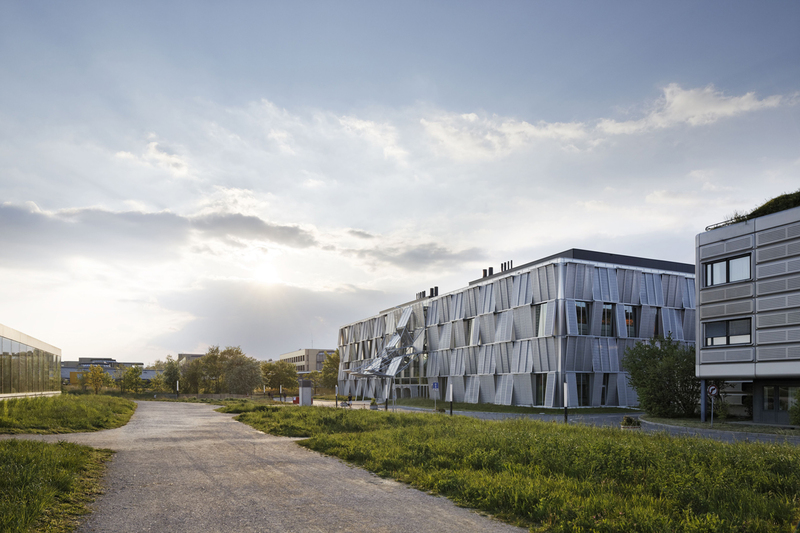 The shape and dimensions of its modules, which were prebuilt in a factory before assembly, were determined by the EPFL’s historic master plan. 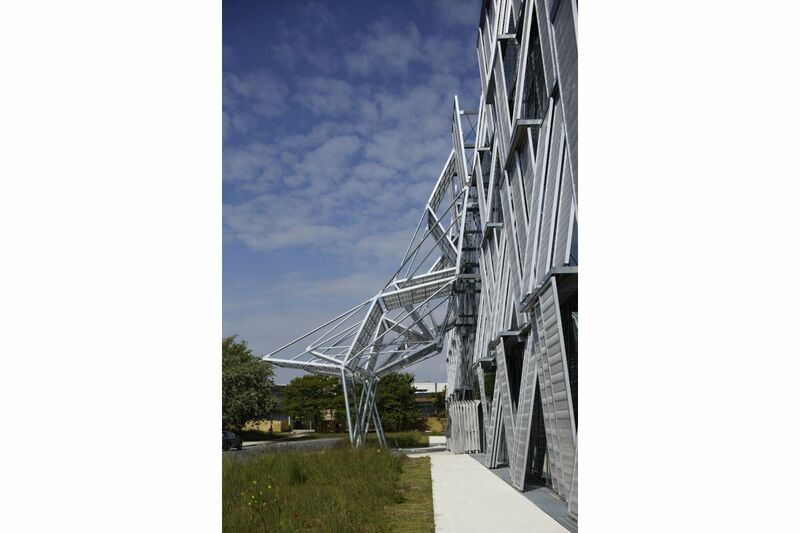 Each module is made up of two superimposed layers: an inner skin offering thermal insulation and soundproofing, and an outer solar protection, consisting of a frame holding the signature metallic mesh used by DPA since the Bibliothèque nationale de France. The modules are divided into three vertical panels, two of which are sliding and one static. The sliding modules can be deployed in front of the glass panes or superimposed on the third one. For thermal optimization purposes, the mobile panels are generally operated through building automation system, but they can also be maneuvered manually. The third module remains in a fixed position on top of the opaque façade panel. 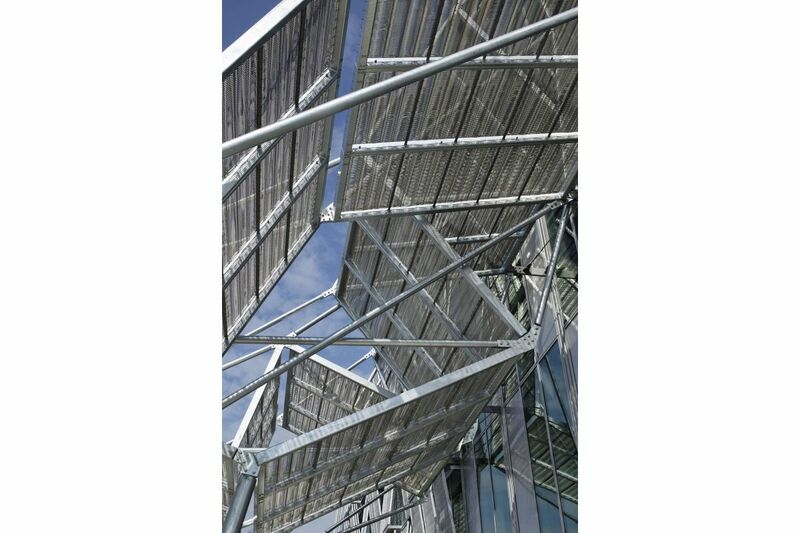 The metallic mesh panels of grey shades are tilted away from the façade by a 5° angle, with different slants; this juxtaposition of oblique planes looks like a woven pattern, or a hinge seen on a macro level. The raw material used to build these automated components denotes the building’s purpose as a space for scientific experiment. 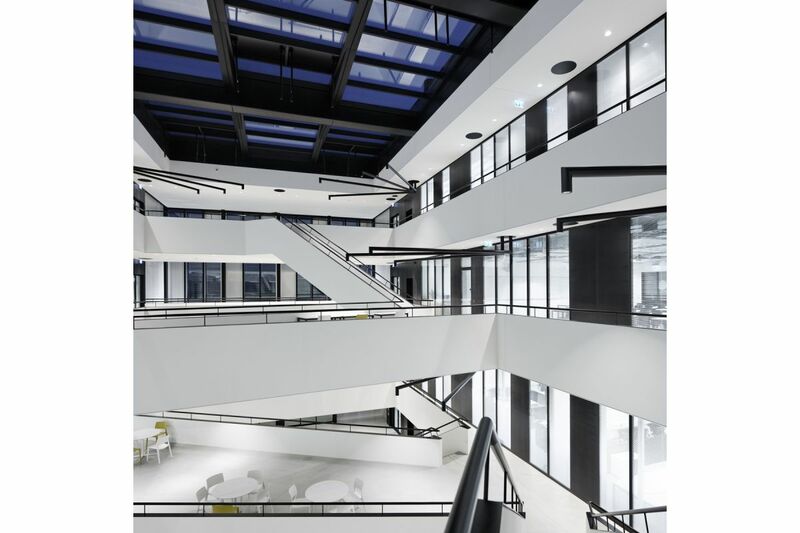 At night, the indoor lighting system amplifies these contrasts by showing the general layout, turning the hall into a lighthouse for the campus. 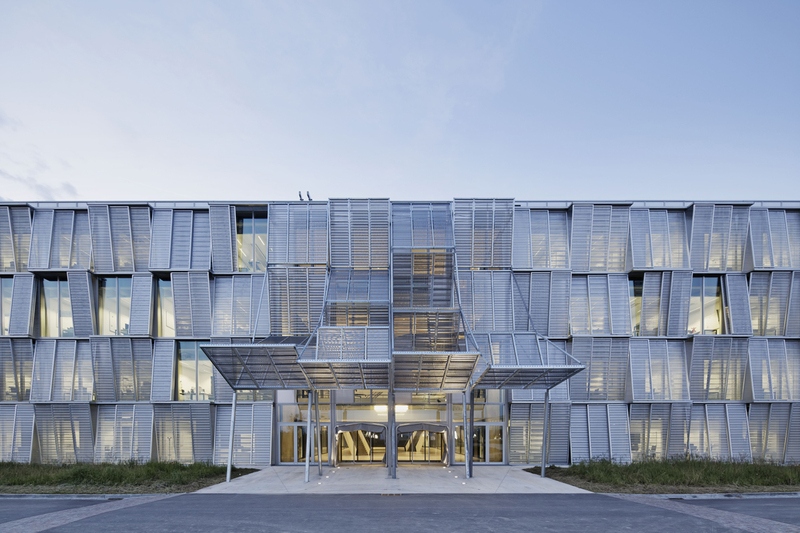 With its blinds that shift and and turn with the Lausanne skies, the slant of the frames and the weave of the mesh, and the visual clash between the threshold and the outer panels, the building offers a range of rich and contrasting perceptions. 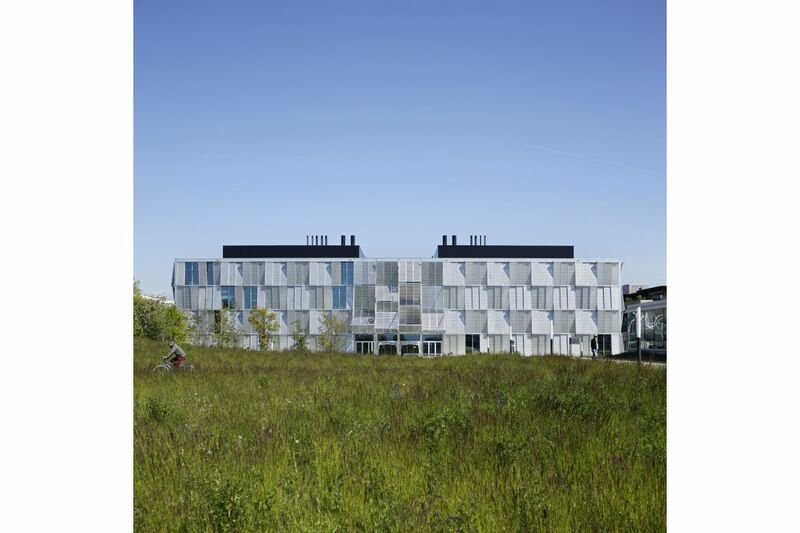 For the historic façade, to the North of the building, the outer coating of the existing facades of the campus was adapted to meet current Minergie® energy standards. Wide horizontal glazings (4’-11” x 9’-10”) are mounted above an opaque apron made of horizontal stamped sheet metal. The outer shell provides insulation, while blinds serve as solar protection for the windows. Science is the essence of the new ME building. 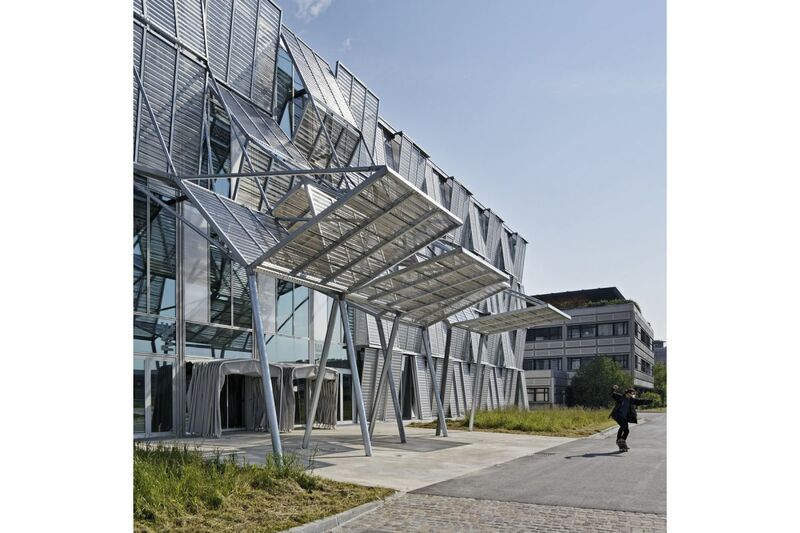 With this architectural project using industrial components and data processing technologies while preserving the circulation network and the structural grid established by the original master plan, the mechanics hall is a new milestone in the history of the EPFL campus. 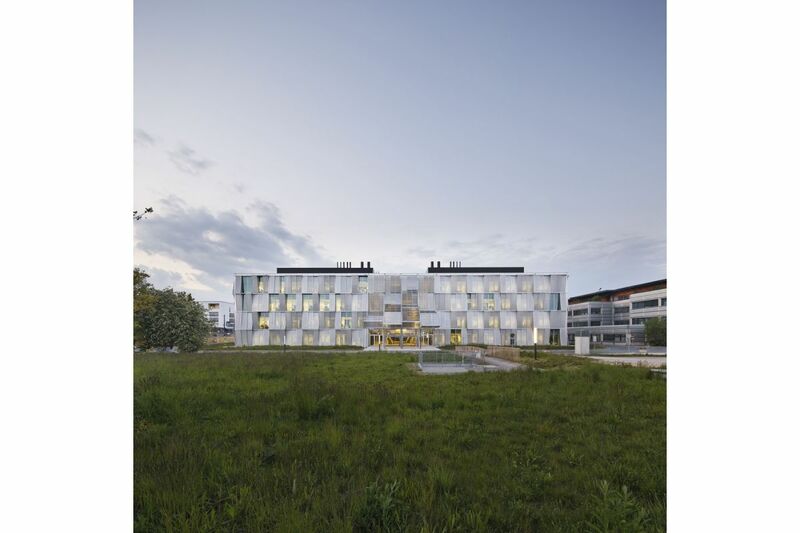 In addition to this brand new building, the 2011 redevelopment competition won by the DPA/Steiner team included challenges across the school’s campus, namely refurbishing the old library to turn it into headquarters for the EPFL (building delivered in 2014), and developing a strategy for a potential Teaching Lab. This last project is an opportunity to reconsider the operation of the campus and the use of its central circulation axis, giving it a broader urban scope.